The formerly heavily degraded, grass and scrub-covered ACCB grounds have largely been planted with native trees to restore the original forest. The total absence of hunting pressure at the ACCB and in its vicinity has additional positive effects on native wildlife. Various animals use the area as a safe haven, and several species that are usually very shy and secretive due to human persecution can be observed at close range. 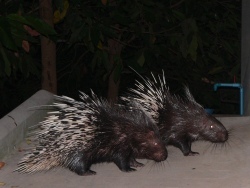 For example, Malayan Porcupines, originally rescued and released at the ACCB, emerge from their burrows at night and roam the area freely. Other mammals include Small Indian Mongoose, Burmese Hare, several species of squirrels, Common Palm Civet, Leopard Cat and a host of so far unidentified nocturnal species. The surrounding forests are still home to rare primates such as Northern Slow Loris, Pileated Gibbon, Pig-tailed Macaque and Silvered Langur. There is also a great diversity of reptiles and during the rainy season the ponds are teeming with frogs. So far, more than 120 bird species have been recorded at the ACCB and in the adjacent forest (for bird list click here).